It’s post-independence Zimbabwe and an atmosphere of nostalgia hangs over much of Harare’s remaining white community. Hayden Eastwood grows up in a family that sets itself apart, distinguishing themselves from Rhodie-Rhodies through their politics: left is good; right is bad. Within the family’s free and easy approach to life, Hayden and his younger brother, Dan, make a pact to never grow up, to play hide and seek and build forts forever, and to never, ever be interested in girls. But as Hayden and Dan develop as teenagers, and the chemicals of adolescence begin to stir, their childhood pact starts to unravel. And with the arrival of Sarah into their lives, the two brothers find themselves embroiled in an unspoken love triangle. While Sarah and Hayden spend increasing amounts of time together, Dan is left to deal with feelings of rejection and the burden of hidden passion alone, and the demise of a silly promise brings with it a wave of destruction. 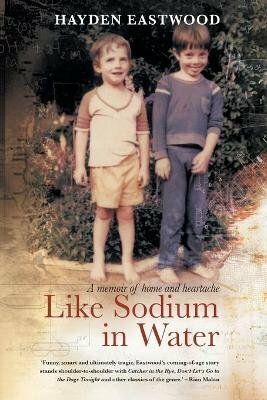 Laced with humour, anger and sadness, Like Sodium in Water is an account of a family in crisis and an exploration of how we only abandon the lies we tell ourselves when we have no other option.